Where did the time go? Unbelievably, National School Choice Week is coming to a close. It’s been a fun ride. Last night, a bunch of kids and parents showed up at the Independence Institute to watch Waiting for Superman in Spanish (more about that later). And today at Noon-1 PM local time (2-3 PM Eastern) you can join me and others for a #schoolchoice Tweet-Up. To suit the occasion, think about the possibilities that more high-quality charter schools could offer students and families in Colorado. Yesterday the Center for Education Reform released the latest edition of the Survey of America’s Charter Schools. What a great place to go to get the “30,000-foot view” of charter trends across the nation. 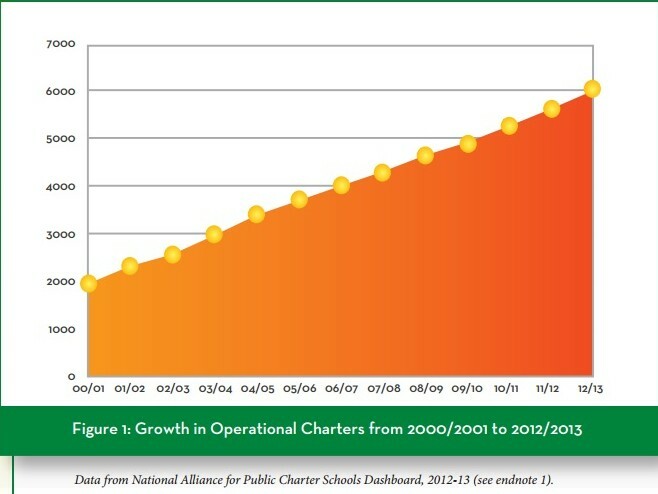 Right there you can see that the number of charter schools nationwide continues to grow at a steady pace. The report points out not only that the growth is much greater and more robust in states with strong charter laws but also that the average charter waiting list continues to grow as well: by 44 from 2009 to 2012. There’s obviously a need both for more charters to meet student and parent demand and for states to strengthen their charter laws. While we’re on the subject, check out this new report explaining how charter schools can effectively serve students in rural communities. The self-governing public school model is often seen as primarily an urban and suburban phenomenon, but Andy Smarick makes a great case that too many states are limiting themselves in this regard. So what’s the hold-up? Waiting lists are growing. Let’s focus on breaking down the obstacles and building up more high-quality options for students seeking alternatives. As famous athletes and celebrities remind us, it’s time for School Choice Now!